The ABBRIATA® MF 70 and MF 70/M mini wrappers permit completely automatic wrapping of small cylindrical bales with plastic film. 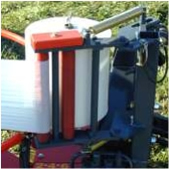 The ABBRIATA® MF 70 mini wrapper is a sturdy wrapper for small cylindrical bales that can be coupled with a tractor through a three-point linkage, powered by the tractor’s hydraulic pump as long as it is fitted with a dual command hydraulic command lever. The bale wrapping is completely automatic. The operator has to select the lap winding number he wants (2, 4, 6). The machine will stop automatically wen the bale has been wropped. Stretching of film in percentage: 50%. 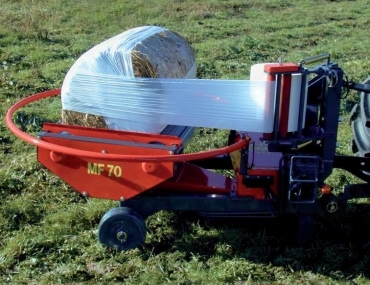 The ABBRIATA® MF 70/M mini wrapper has features that make it possible to couple to all tractor types using a three-point linkage and is driven by a power take-off via cardan shaft. 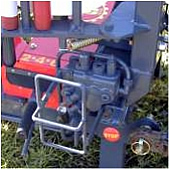 The binding of the bales is fully automatic: the operator only needs to decide on the type of binding he wants (the film can be wrapped around the bale 2 or 4 times) and then use the start lever to start binding.